Hidden object puzzles are big money these days, drawing in unsuspecting players with tales of relaxing but addictive gameplay. WiiWare has already seen the disappointing "Aha! I Found It!" 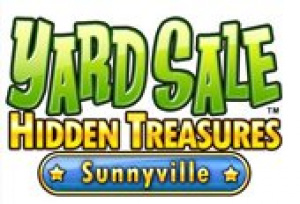 Hidden Object Game but now Konami is here with a new challenger, Yard Sale Hidden Treasures: Sunnyville, and it's got a few tricks up its sleeve. 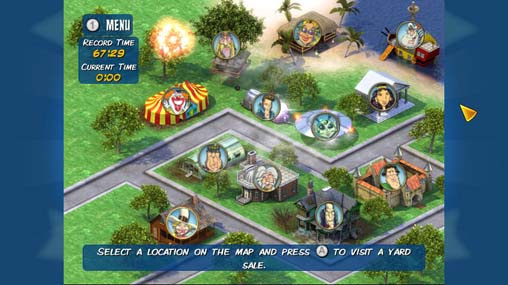 Set in a fictional US town populated by caricatures and stereotypes, the game centres around a new member of the neighbourhood entering the "Superstar Homes Magazine Contest", essentially an excuse to hunt around other people's houses to find furniture. It's not the world's greatest plot but it adds some purpose to proceedings and the colourful characters, although long worn-out stereotypes – an Austrian scientist named E. Stein, a 60s hippie called T. Hugger – at least bring a bit of humour to the game. "Aha! I Found It!" fell down on its blurry and indistinct graphics that made finding given objects a chore, but Sunnyville suffers no such problem: everything is generally clear, although there are some issues where item names are a little blurry, making it tough to know what you're after. It's certainly far less prevalent than in "Aha! I Found It! ", however, and the difficulty in finding objects is through clever placement rather than outright trying to trick the player: rarely will an item be camouflaged, and the game even requires some lateral thinking from time to time, asking the player to find two spades which are two different meanings of the word. If you fancy a soothing stab at the game, the Relaxed Mode is for you: with no time limits and no penalties you're free to take the entire story at your own pace, with the ability to save and resume after each level. If you're a more seasoned object-finder, you'll probably want to play in Timed Mode, which is exactly as you'd expect, with a constantly ticking time limit and penalties for attempting to pick up anything not on your list. 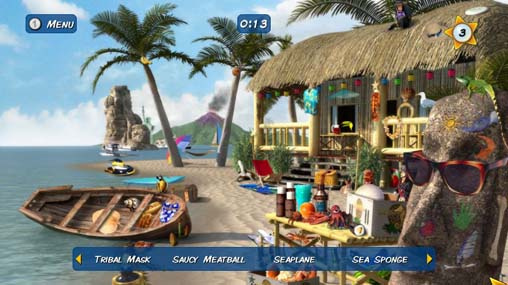 There are three save files available so you can even have one of each mode on the go, and completing any difficulty also unlocks a second play mode named Sunnyville Tours, beefing up the package. Finding objects isn't the be-all and end-all in Sunnyville, however: you must take those amazing finds and turn them into serviceable furniture through a series of short but fun minigames, for want of a better word. Spraypainting, sanding, cutting, sewing: it's all here, and although most of the interactions boil down to spraying something completely or tracing a straight line with your Wii Remote, it still adds a little welcome variety. Graphically speaking there's not too much to write home about, with decent character portraits and generally clear settings: there are a few animated touches in each level, but on the whole you'll be looking at static images trying desperately to find that last juggling ball. The music is best forgotten, but thankfully you can turn it off completely should it be too much to bear. Yard Sale Hidden Treasures: Sunnyville is a good buy for anyone into hidden object games as well as those looking to dip their toe into the water for the first time. It won't blow you away but it's an enjoyable way to pass the time, and the addition of short minigames help to spice up proceedings. For only 500 Points this is better value than some other games on the service, so if you feel like a few hours spotting hidden items then this is your best bet on WiiWare so far. Cool review! I buy it! Another great read, James. Thanks for a quality review! too late, i already spent my last 500 pts on Mega Man 2. maybe next time, though. Not my kinda game, but its a good game none-the-less for either seasoned item finders or for those willing to give it a go. As always nice review James! Which do you think is better The Mystery of Whiterock Castle or this one? The concept sounds kinda boring. This is better than 5 Spot Party? It doesn't look like my type of game,but at the same time it's refreshing to see a game like this so polished and well made.I may give it a consideration if i ever find myself with only 500 points left on my Wii. I enjoy this type of games and the more releases (and at budget prices) the better. Now, isn't there a DS version of this game? Anyone know the differences? My wife loves these types of games. I would love to surprise her with one in the near future (especially since she really feels overwhelmed by so many options whenever she thinks about buying a game). I could get her this; anyone seen better out there that I should try first (we have none of these types of games on the Wii but a few on the DS)? Glad this game didnt get bashed. It is pretty decent. And I agree about a 6 or a 7. The zoom feature is what makes this great for me. i love this game i got my whole family in on it im trying to find something else that is just like this anyone have some good ones? I picked this up as my first hidden object game, since it was so cheap, just to see if I'd like the genre. In this case cheap definitely doesn't equal crap! Even though it's only 500 points, it's clear it was well-thought out and plenty of effort went into it. I think it's a port from the PC, but it's quite a good one! Overall it's pretty easy, though it took me a while to realize that B dragged the screen around. Prior to that I was just zooming in and out. It was a discovery I was pleased to make, because it made the controls far more fluid. 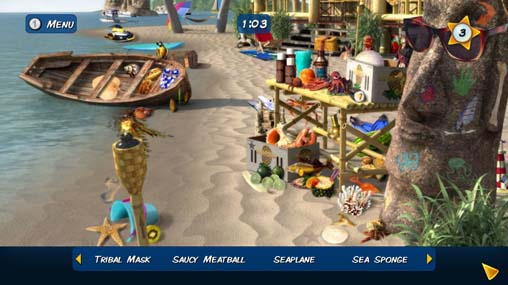 The minigames are especially easy. They 100% you every time (at least on Relaxed Mode) and even finish you up once you get close to finishing the task at hand. In fact, they are extremely forgiving and it's basically impossible to screw up, but this isn't a bad thing if you're buying this for younger or less experienced gamers. The game in general has a "for kids of all ages" feel to it. It's never too hard to find everything. Each level starts you off with three hints and by picking up stars (one per yard sale) you can nab a few more. If you're stuck, you're never stuck for long. Anyway, overall it's a decent game at a bargain price with probably at least 3-5 hours of gameplay per mode (unless you're a truly seasoned item spotter, of course). Nothing is going to blow you out of the water on this one, but it's a sound purchase for the genre, and relatively enjoyable. Basically, I agree with the review (which was excellent) and give this a 7/10. I'm playing it on relaxed mode, and while the hidden object puzzes are still almost impossible, the side activities could be solved by a one-year-old. although, i probably won`t get this. i had to see what it was actualy about, especially as the description on the wii shop is so minimal that i couldn`t even make out type of game it was supposed to be.